First and foremost I want to thank you all so much for your words of kindness and encouragement. It means so much to me and my family. Today was a day of craziness.... whats new? First thing this morning we headed to the school for Makenzie's IEP meeting. All in all it went very well. We met not only with the preschool staff but also the elementary staff. Even though I have been concerned about sending Makenzie to Kindergarten we still needed to discuss the option and find out a little bit more on what that would look like. I have walked the halls of this school now for 7 years. It is very comfortable. I know the staff and the staff knows me. They were there at the time of Makenzie's accident, they have and continue to do a wonderful job with my boys. So I was greeted by many familiar faces. Faces that to some degree already know what my family has been through and that was comforting. We talked about how Makenzie was doing in preschool, some of my concerns, and then about what Kindergarten would look like, what services she would receive, and of course we talked about goals. I still really feel that another year of preschool would be the best thing for Makenzie but at this current time that would mean yet another school and team of specialists only to switch schools again the next year. That I am sure is not the best plan for Makenzie. Of course I still have MANY unanswered questions that need to be answered. 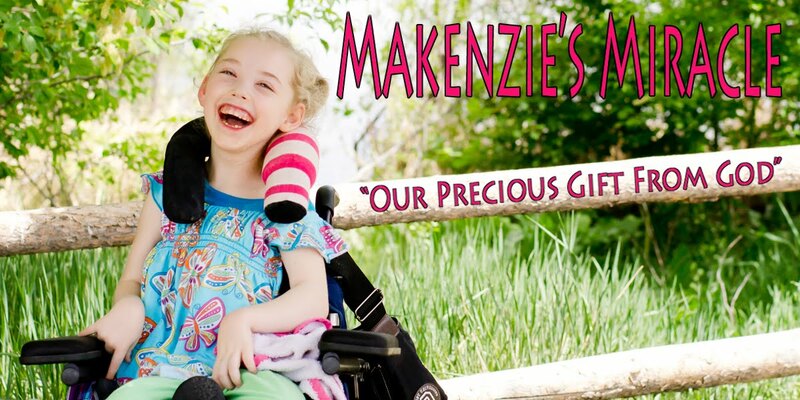 I also hope to spend a day with Makenzie both in the morning and afternoon classes before this school year is over. The teacher that I would prefer to have, who was also all 3of my boy's teacher in Kinder, only works in the morning. I am not sure getting Makenzie ready and out the door along with my other children by 8am is feasible. This is 4 months from now and have decided to wait for a bit to try and figure this all out. Who knows what life will look like then. Then it was off to take my perfectly healthy daughter to the germ infected doctors office to appease my lovey new friends. So really our doctor's office is incredibly clean but it is a place where sick people tend to congregate and that is all it takes to become germ infected! The results.... Princess Makenzie is 100% healthy. Her lungs were clear, her bowels were moving, her weight was up by about 2 lbs, and her ears and throat were perfect. There I did it....to who ever started this.... are ya happy?.... cause if my kid is sick in 3 days I will not be very happy at all! What a gross waste of time and money but Makenzie is worth it. Honestly if I had any concerns the first place I would have gone in to my favorite germ infested doctors office but I had none. I know what I am looking for... I have been doing this for over 3 years. I have made MANY unnecessary visits to the ER because I always air on the side of caution. I may not be a doctor but I am a mom who knows her daughter VERY well! Then it was off to the dentist for my son. Poor guy! After the drilling subsided and gauze was placed in my sons numb mouth is was back home to feed Makenzie and get her off to dream land. Today was a very good day. Makenzie was so happy. She did great with her feeding and ate so much by mouth! Tomorrow we have a crazy busy day again. I was given free tickets to a mothers tea that Makenzie and I will be attending and then get to hang out with a close friend and her kids for a baby shower tomorrow night. I can't wait for little Morgan to be born cause boy do I NEED a baby fix! It has been WAY to long! "When anxiety was great within me, your consolation brought joy to my soul." So glad that Miss Mac is healthy. I'll join you in pounding your new friends if she gets sick. I mean HELLO? !